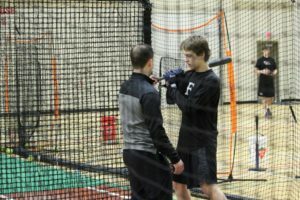 Back in February of 2018 the first steps were taken to enhance the long-term development of local baseball players as well as keeping local baseball talent in Red Deer. Many of the Boys of Summer (and in some cases, girls) headed north or south to hone their baseball skills at academies outside of the region in years past. Now players can level the playing field with their own academy right here. The St. Josephs Baseball/Softball Academy has been around for a year under the guidance of Scott Murray, softball coach Terri Hunter and former Red Deer Rigger Jason Chatwood. It appears to be hitting a home run with the locals as there are about 50 players signed up and more to come on board next school year. “It’s something that I love and you get into coaching and you do that but for it to be a part of your day and you get to work with kids all the time and on different parts of the game, it was an opportunity I couldn’t pass up,” said Chatwood, a graduate of Gonzaga University’s baseball program who signed on about a year ago. The academy is committed to improving the skills of the players who show up for workouts as part of their school day. But it’s not just those skills on the diamond which are being measured. If there is a sport which set the bar for breaking down an individual athlete’s skills, it’s baseball. Chatwood says these young players get the benefit of some intense individual instruction in baseball and softball. Individual plans are created to map out a strategy to enhance what each player brings to the plate. 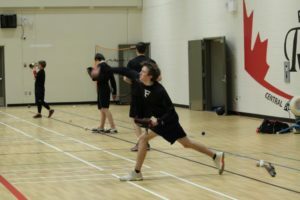 What a grade 12 student will do at practice might be different from a grade 10 student, but the goal is the same-improve. Nobody is pigeon-holed into a position either. Chatwood says they don’t feel players at a younger age should be just an outfielder, infielder or a pitcher. However, when instruction is broken down into specific areas such as hitting and pitching, Chatwood says the idea is to help the player develop a strong skill set in order to try things. “It’s good for them to fail a little bit. It’s okay to try something and not have instant success because then it helps you push to want to improve,” he said. 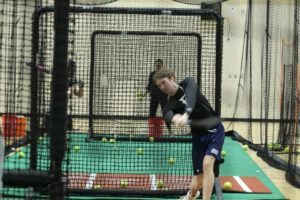 High-end instructors can be brought in to give another perspective on what the players are working on that day whether it be throwing, catching or hitting. The basics are where it all starts for the academy and it is as simple as being able to play catch said Chatwood. It is how they start every practice (they refer to it as catch/play) and he thinks it’s the most important time of the session to work on aspects of the individual’s game. When it comes to hitting Chatwood says the talk is really focussed on hitting the ball hard where it’s pitched and up the middle is generally the target. It sounds simple enough but Chatwood says young players want to pull the ball all the time and get it into the air. The standard radar gun is employed for both hitters and pitchers at the academy. It will measure exit velocity for hitters and miles-per-hour for pitchers. Chatwood says the results are there and it gives them instant data. At the end of a hard day of baseball Chatwood says what really makes him smile is being able to build relationships with these players and see them grow. Chatwood says it was hard to envision what this would look like when the idea was hatched but it appears the academy has stepped up to the plate for the sport in Central Alberta, touching all the bases.